In this article, we will show you, How to Format Power BI Filled Map with example. 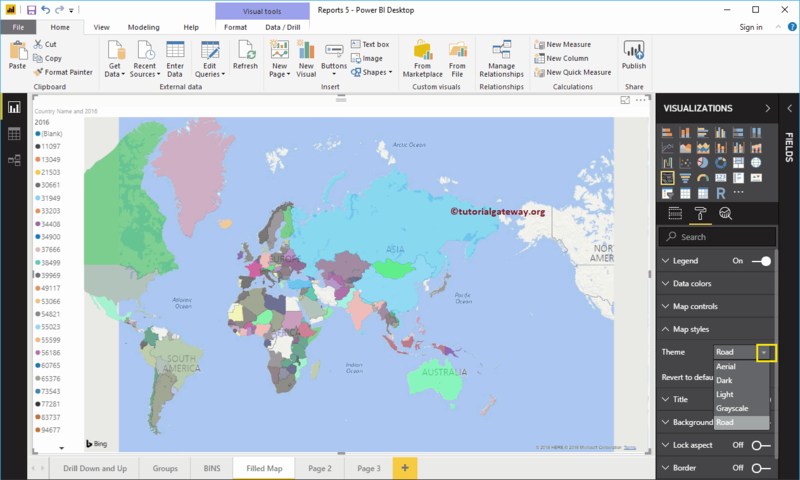 This includes changing the Map Color, filled Map Title text, Title position, background color etc. To demonstrate these formatting options, we are going to use the filled Map that we created earlier. 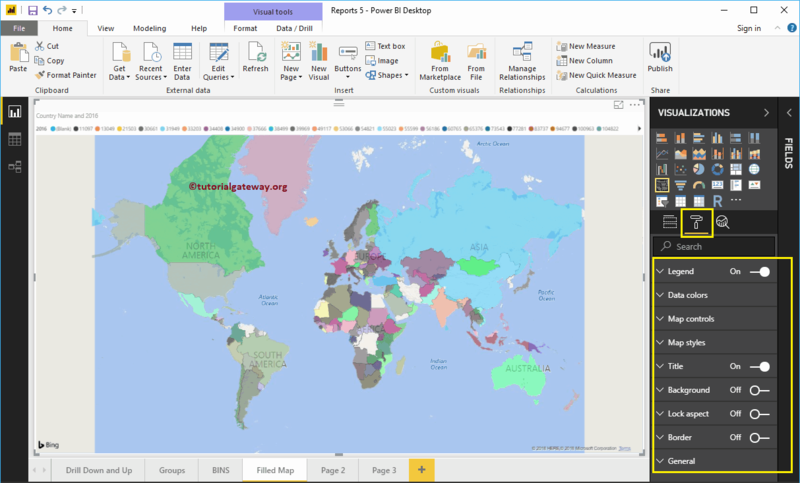 Please refer Create a Filled Map in Power BI article to understand the process of creating a filled map. Please click on the Format button to see the list of available formatting options for this filled map. As you can see from the below screenshot, we used the Position drop down box to change the legend position to Left. Next we changed the legend text size to 11. 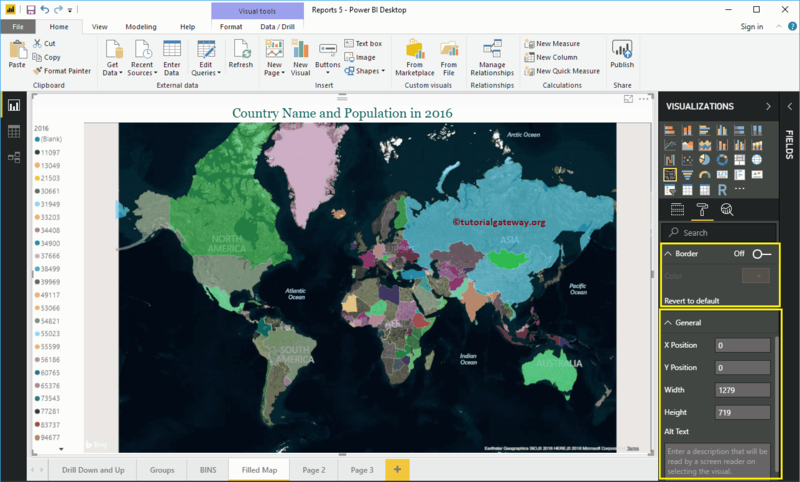 Use this Data Colors section to change the color of each and every individual area (here, it is country). By default, auto zoom option is enable for this filled map. However, you can disable by toggling Auto zoom option from on to off. Use this section to change the look or theme of a map. Let me select the Aerial Theme. By toggling the Title option from On to Off you can disable the filled Map title. From the below screenshot you can see, we change the Font Color to Green, Text Size to 20, Title Alignment to center, and Font Family to Georgia. If you want, you can add the background Color to the title as well. 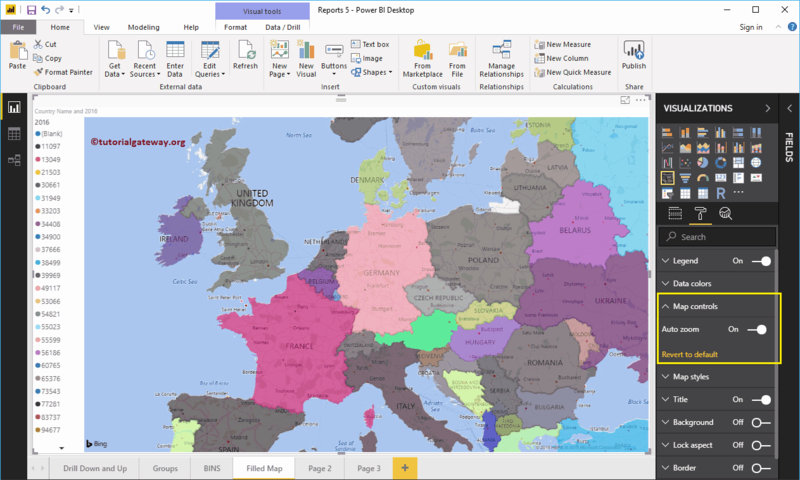 You can add Background color to a filled Map by toggling Background option to On. For the demonstration purpose, we added yellow color with 17% transparency.